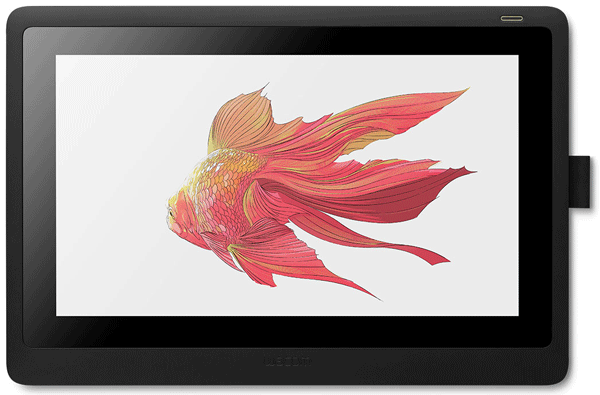 By introducing a Cintiq lower screen resolution & color gamut, and with a lower price. Wacom is trying to create an affordable option to those who can’t afford its higher models. To a good degree, it succeeded. The 1920 x 1080 screen & its 72% NTSC color gamut, Cintiq 16 is on par with the some of the Cintiq alternatives. The support for VESA mount, which makes it easy to mount it on its own stand, as well as an arm, is a nice feature missed on some of the more expensive Cintiqs. Unlike the other Cintiq alternatives, Cintiq 16 fully supports tilt sensitivity, which is a nice bonus feature to get your hands on. Out of the box, Cintiq 16 supports HDMI & the regular USB-A, making it more reachable to anyone with a computer that doesn’t include the newer ports like USB-C (the Cintiq Pro 16 requires it to work natively, or you will have to use the Wacom Link or some other adapter to run it). In this post, I will mention some of the differences between Cintiq 16 & the Cintiq Pro 16 (reviewed here). There will be a dedicated post with the difference between the two if you only want to decide on which one to buy. Credit to many of the information in this review goes to Kahmeel from Reddit. Who shared insights about their new Cintiq 16 with all of us. 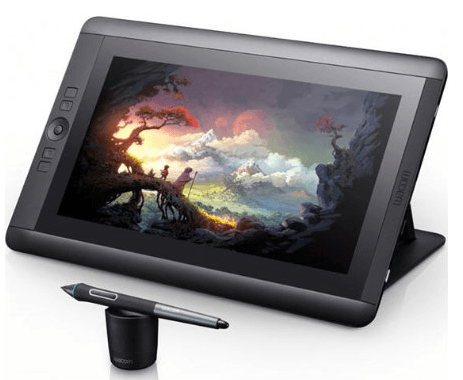 Should You Get This Or The Cintiq Pro 16? Relatively cheap compared to a Wacom pen display. Supports HDMI port out of the box. Supports VESA mount out of the box. Doesn’t come with the Wacom Express Key Remote, and offers no express key of any sort. The color gamut is a bit too low. Color Gamut 72% NTSC (CIE1931) typical (equivalent to 100% RGB). Comes with a pen holder that can be attached to the side. Has built-in legs that can be folded out to 19 degrees. Supported operating system(Windows):- Windows® 7 or later (latest service pack/build). Supported operating system(Mac):- OS X 10.12 or later (latest update). Cintiq 16 has a 1920 x 1080 resolution (1080p), which is the reason I can imagine people calling it Cintiq 16HD, which is a fitting name. This is a lower resolution than the Cintiq Pro 16 (which supports up to 4K resolution, or 3840 x 2160 to be precise). While some artists may prefer to have a higher resolution, this resolution won’t stop you from creating excellent artworks. Specially if you plan to draw on lower resolutions. For that reason, I won’t count that as a con. If you’re new to digital art, this size & resolution will be more than enough for you (unless you are willing to shell out the cash for the more expensive Cintiq, which is not a bad idea over the long term). If anything, it’s the drawing on the screen directly that makes a huge difference. There are times I return to my large Intuits Pro (reviewed here), and I tend to take some time to get used to drawing with it again (which is totally doable). Not let’s get to the amount of colors Cintiq 16 can display. It has 100% sRBG color gamut, which is equivalent to 72% NTSC color. This is good, but may not be enough to work professionally. I have already criticized the Chinese Cintiq Alternatives for their lack of wide color range. Don’t get me wrong, it’s not that the colors look horrible on it (though they will appear slightly dimmed), but it’s much harder to produce pictures with consistent colors across multiple screens with such color gamut. This is important only depending on what you plan to do with it. For example, if you plan to do line art, or you are okay with having colors off in your final drawing (like you’re just a hobbyist), then the colors won’t be an issue for you. If you are willing to check the colors in another monitor with great color gamut, then you won’t have issue with any pen display on the market. Cintiq 16 supports HDMI port out of the box, and you need to have HDMI port, as well as one USB-A port in your computer to use it. Wacom learned from their mistakes from Cintiq 16 days, which required USB-C to run natively without any adapter, and has been adding HDMI in their products. This is a good thing, as many who would buy an affordable pen display like this would sure not necessarily have a computer with USB-C port that supports connecting displays (yes, not all USB-C ports are the same). Cintiq 16 is connected to computer using the included 3-in-1-Cable for that. Having such a cable is pretty convenient to prevent cable clutter, but unlike the pen displays that requires a separate cable for both USB & display, replacing the tablet in case it got damaged requires you to buy a replacement from Wacom(Or any shop that sells the cable). It’s worth mentioning that the cable is about 6 feet long. In case your computer doesn’t have a HDMI cable, you will need an adapter for that. 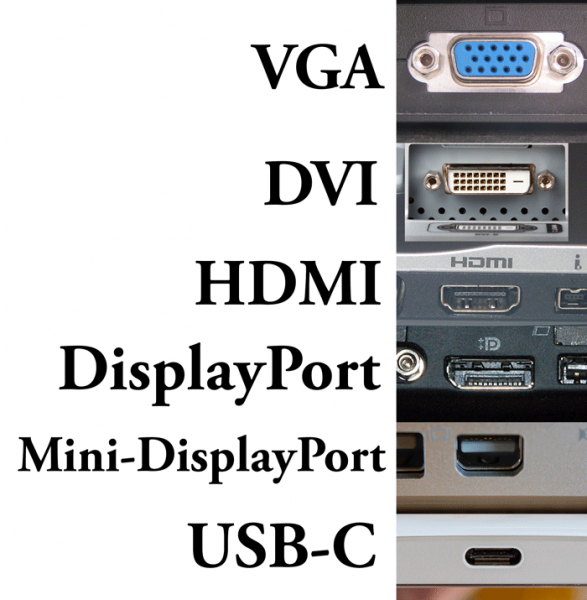 Fortunately, all the modern display cables, like DVI, USB-C, DisplayPort & Mini-DisplayPort, can be converted to HDMI easily. That includes the majority of computers in the market (If your computer only have VGA cable, connecting it to your computer may pose an issue). 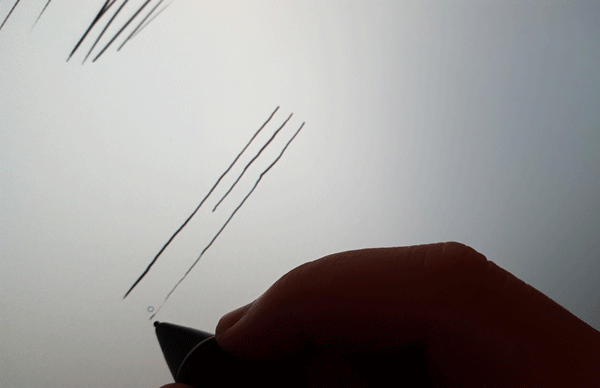 Cintiq 16 supports 8192 levels of pressure sensitivity, which became the standard in drawing devices nowadays. Pressure sensitivity is a feature that allows you to create thinner or thicker lines based on the amount of pressure you place on the pen while drawing. It can also be used to control brush opacity and other things, depending on your art program. Just keep in mind that more pressure doesn’t equate better tablet, as you don’t need to have a high pressure levels to have a decent drawing experience. It’s more of the other things like IAF & parallax that could make or break your experience. I will talk more about these shortly. It also supports tilt sensitivity, which tilts the brush you’re drawing with while you’re drawing with, just like you could do with traditional brushes. For tilt sensitivity to work, your art program needs to support that features. 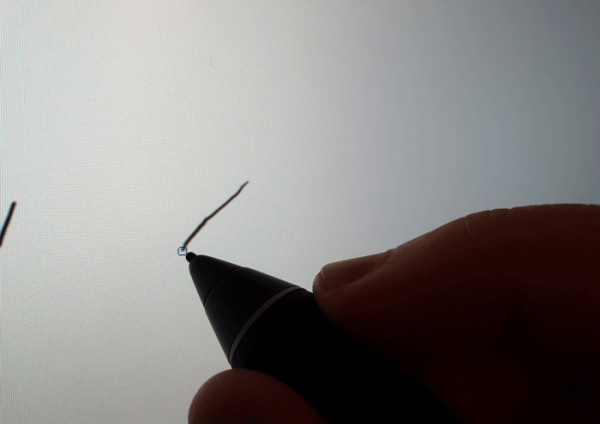 This is one of the features you usually only see in Wacom devices. It’s not an essential features, but it’s nice to have it in case you needed it. The reason that parallax could be higher than the Cintiq Pro is that the screen is not laminated. By laminated, I mean having the LCD panel & the glass in one piece, which lower the distance between the cursor & the pen tip (having such distance is the main culprit for parallax). What’s parallax? 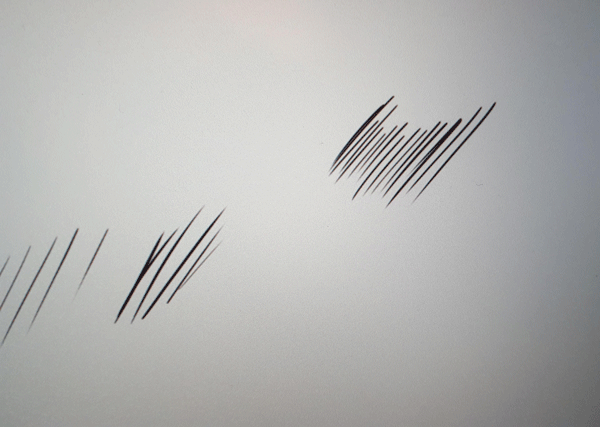 It’s a slight cursor offset from the pen tip, where the lines you draw appear slightly besides where you placed the pen tip. It can make drawing a bit annoying for those who are used to traditional drawing media, but you could get used to it after some time. Calibrating the screen allows you to set it to kinda acceptable levels as well. When it comes to initial activation force (IAF), or the minimum amount you need to press the pen on the screen to start to see strokes, this is one of the drawing aspects where Wacom shines. As you could see lines from the slightest pressure on the screen. This is probably the part I like about Wacom the most. It’s also the reason why I would recommend Wacom to anyone willing to use it as a mouse replacement, for things like video editing & the likes. If you ever thought the IAF too sensitive for you, then you could adjust that from the driver settings. As per Kahmeel’s experiments, there’s no jitter while drawing diagonal lines. Drawing hatched lines was good too, and no fishhooks appeared in them. If you’re concerned, Cintiq 16 doesn’t overheat or have loud fan issues. Cintiq 16 doesn’t support touch, which is one of the things Wacom removed from the Cintiq Pro 16 in order to make this one affordable. From what I saw in Cintiq Pro 16, Touch not as smooth as the ones we get in smart phones. Though the idea of having it is awesome (though it sometimes gets in the way). Being able to switch tools by just touching their icons, or by using gestures to zoom in & out the canvas can be quite productive, and it can help you minimize the need to reach out for the keyboard. I totally believe that touch has a brilliant future in pen displays, but maybe not now. So unlike express keys & color range & possibly resolution, touch isn’t a deal breaker, especially if you’re getting a Cintiq for the first time. Of course, you’re the best one to determine the important of this feature. The best way is to try it in a store, or by renting a Cintiq with one if that’s possible in your country. Cintiq 16 comes with Pro Pen 2, the same pen you get with the Cintiq Pro 16. Just like all the other Cintiq Pens, it comes with 2 buttons in the side, which can be programmed just like the express keys, as well as an eraser at the back of it. There’s a simple pen holder you could attach to the side of the Cintiq in order to avoid losing it (this happens a lot to Wacom owners, me included). Inside the pen holder, there are 3 replacement pen tips (nibs) to replace the ones in your pen in case if wore down. You do that to avoid scratching the screen of your Cintiq. Cintiq 16 has no Express Keys, the keys you could program to do all sorts of keyboard shortcuts, mouse buttons & more. It has been the trend for Wacom not to add express key to their latest Cintiq models. Whether you need those keys is up to you, trying them is the best way to decide. Many artists don’t care about them, and opt to use keyboard shortcuts instead, which what you must do if you use too many shortcuts. I personally use keyboard shortcuts most of the time, but there are times where I used hot keys when I didn’t need much shortcuts, like when I sketch, as that’s the case where express keys really shine. If you need express keys, you could get yourself the Wacom Express Key Remote, which contains 17 express key, as well as a touch ring, which could make resizing brushes & zooming in & out. The remote is sold separately though. One of the things that set Cintiq 16 apart from the other Cintiq models is the VESA mount support. This allows you to mount it to all sort of fixtures, including arms. If your desk & budget allows you, you could attach it to an arm & move it around freely. Bear in mind that you may need shorter screws or spacers to make is fit anything other than its own stand. Since the screws may not go all the way in. I say this because one of the prominent reviews in Amazon complained about that. Wacom support representative said that the screws depth in Ciniq 16 is about 5.7mm, so keep that in mind before you buy. If you don’t want to attach Cintiq 16 to an arm, there’s an optional stand that allows you to place it on your desk, and tilt it backward & forward to your heart content. If you’re familiar with the Chinese Cintiq alternatives, you will know what kind of stand I am talking about. Besides that, Cintiq 16 has retraceable legs built in, which allows you to set it tilted on your desk as well. You may be reading this review and noticed that Cintiq Pro 16 has some features Cintiq 16 doesn’t. 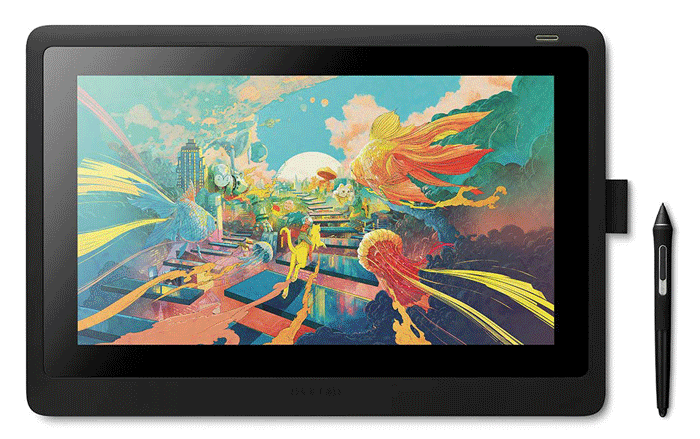 It probably made you wonder if you should get Cintiq 16 or Cintiq Pro 16. This can be tricky, but if you’re new to digital art, or if this your first pen display, you could do very well with Cintiq 16. Many of the missing features are not needed by everyone, and make this particular Cintiq a Wacom version of the other Cintiq alternatives. It’s good for drawing and creating good artworks. If there’s anything that could affect your art by using it, then you already know about it from reading this review (which I tried to make comprehensible). To make things even easier, I plan to write a quick comparison between Cintiq 16 & Cintiq Pro 16, which I will link to here once it’s out. Since Cintiq 13HD is still available in the market, and since it’s also an affordable Cintiq. You may be wondering if you could get that one instead. Both Cintiq 13HD & Cintiq Pro have the same screen resolution. You will get a smaller screen with the 13HD, which may seem cramped for some artists (some others won’t mind it at all). The part where Cintiq 13HD shines is the 4 express keys, as well as the rocker button, but that probably wouldn’t be a sole reason to get it. 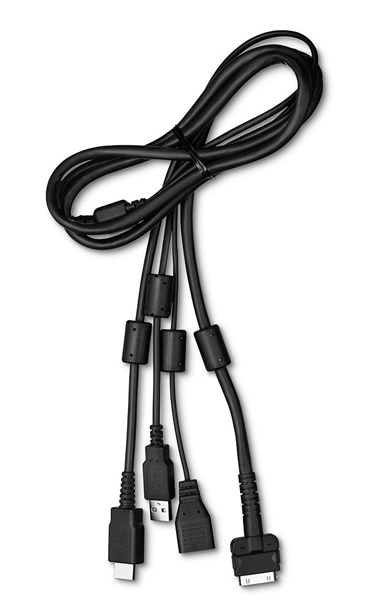 While both of them use 3-in-1 cable, the Cintiq 13HD is notorious for having a sensitive cable that get disconnected often (do a quick internet search to know what I mean). Since Cintiq 16 is a much newer Cintiq, you are likely going to get much longer driver support for both newer Windows & Mac versions. The only good part about the Cintiq 13HD is that you could find it at bargain prices at times, especially when you are low on cash & looking for a used Cintiq. Where I would encourage you to go for it. Other than that, I would side with Cintiq 16 for the most part. After we saw Wacom kept offering bigger & pricier Cintiq models, it’s nice to see it offering an entry-level pen display for us to enjoy. Just so I could be 100% honest with you. While Wacom is the standard used by professional artists to this day, it’s not without driver issues. So please be prepared to face some in case you decided to get Cintiq 16. Though I hope you never have to face anything like that. You can refer to my What’s wrong with Wacom drivers And Their Issues? And what are the alternatives? post here to know more about that if you’re curious. If you’re new to Wacom devices, I suggest you check out my book Getting started with Wacom graphics tablet and Digital Painting With Photoshop book, which contains a lot of useful information to introduce you to digital art using Wacom devices. I have enjoyed reading many of your reviews and digital art tips. I have a question concerning the Cintiq 16 in terms of it’s VESA mount port. Is the Cintiq 16 compatible with VESA mounting arms such as an Ergotron or Amazonbasics arm? I ask this because of an Amazon review of the Cintiq 16 states that the VESA mount size is not compatible and requires an additional accessory in order for the screws and bracket to fit. I read that review, and that person had no issue with compatibility, but with getting the screws to go all the way in, which is certainly a big issue. I will take a closer look at this issue, and update my review accordingly. The accessory the user has mentioned is the optional stand I mentioned in the review. As far as I know, you don’t need it if you’re going to use an arm, but you may need to use spacers or some other way to make the screws fit well. It’s sad that this happens, specially that this is the first time for quite some time to see a Wacom tablet that supports VESA mount. Just say to say the port display summary is super useful!